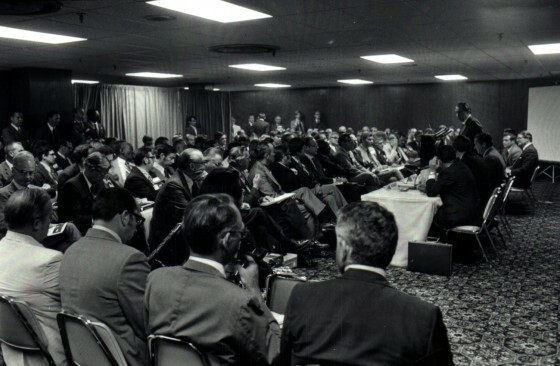 President Nixon addresses Midwestern media executives in Kansas City on July 6 1971. 44 years ago, President Nixon acknowledged the harsh reality of America’s standing in the world: that it could no longer claim global hegemony in an increasingly multi-polar and competitive world. In 1971, the United States was still the richest and most powerful nation in the world. But other power centers capable of challenging the U.S. on every front existed, and it was a reality, Nixon believed, that the country needed to face. He specified the five “great power centers:” the United States, Western Europe, Japan, the U.S.S.R., and finally China. What nobody knew was that President Nixon made these allusions to the United States’ changing attitude toward China just as head NSC Adviser Henry Kissinger was embarking on a ten-day secret mission to the Far East code-named Polo I–setting the stage for President Nixon’s visit to China the following year. His remarks in Kansas City carried far greater significance than an observer at the media conference would have suspected. On July 6 I flew to Kansas City to address a large group of Midwestern news media executives…Kissinger was in the middle of a ten-day mission to the Far East and just days away from his secret trip to Peking. Before he got there I wanted to place on the record an outline of the reasons for approaching China. I told the gathering that the potential for China, though obscured to most American observers by its isolation, was such that no foreign policy could ignore or exclude it…Despite the recent flurry of activity (the ping-pong matches, termination of travel restrictions, and a May 31 invitation from Mao Tse-Tung) I said that I did not hold out any great hopes of rapid advances in our relations…My speech received relatively little attention in Kansas City. As we were to learn later, however, it received a great deal of attention in Peking. At one point Chou asked about my Kansas City speech, and Kissinger had to admit that he had read only the press reports. The next morning at breakfast Kissinger found a copy of my speech, with Chou’s underlinings and marginal notations in Chinese, lying on the table with a note requesting that he return it because it was Chou’s only copy.